Merethe Lindstrøm has published several novels and collections of short stories, and a children’s book. She was nominated for the Nordic Council Literature Prize and for the Norwegian Critics’ Award in 2008 for her short-story collection The Guests. The same year, she received the Doubloug Prize for her entire literary work. 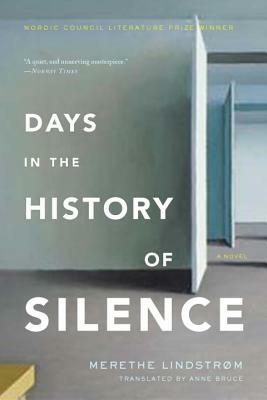 Days in the History of Silence is her most recent novel, nominated for the Norwegian Channel 2 Listeners’ Novel Prize, and winner of the Nordic Council Literature Prize and the Norwegian Critics’ Prize. She lives in Oslo, Norway. Anne Bruce has degrees in Norwegian and English from Glasgow University covering both Nynorsk and Bokmål, classic and modern texts, written and spoken Norwegian, as well as Old Norse, Icelandic, Swedish, and Danish. She has traveled extensively throughout Scandinavia on lecture and study visits, and undertaken translation and interpretation for visiting groups from Norway. She has translated Wencke Mühleisen’s I Should Have Lifted You Carefully Over, Jørn Lier Horst’s Dregs, and Anne Holt’s Blessed Are Those Who Thirst. The “intruder” who enters Eva and Simon’s house in the beginning of the novel is at first an unsettling presence, but later in the book he comes to represent something else to Eva. Why does Lindstrøm open with this scene, and how does it relate to the rest of the book? Despite Marija’s hateful anti-Semitic remarks, Eva finds herself extremely affected by her absence after she and Simon dismiss her. What role does Marija play in Simon and Eva’s relationship that becomes such a profound loss after she is gone? Simon and Eva both decide at different times that it’s best not to tell their daughters about their respective pasts. To what extent can hiding the past from the next generation be a selfish act or a benevolent one? Is keeping painful secrets from loved ones, as Simon and Eva do throughout this novel, ever justified? How do you interpret Simon’s descent into silence? Is it a kind of protest, a result of dementia, or perhaps something else? Do you think Simon is making a choice to be silent? If so, why do you think he chooses silence over telling? What role does guilt play in Simon and Eva’s relationship with each other and with their family? Simon searches for his missing relatives and Eva begins to imagine her son’s fate more and more as the book progresses. How are Simon’s and Eva’s “searches” for missing relatives different, and how might this account for their growing distance from each other? At the end of the novel, it is implied that Eva has finally decided to share the truth with her daughters. What ultimately prompts this decision? Do you feel that it is for the best?